Banking and Finance Law provides a thorough grounding in the fundamental principles of international finance and financial services law, covering local and international developments from practical, regulatory and policy perspectives. A wide range of regulatory and transactional areas are covered including, monetary law, banking law, financial regulation, central banking, securities law, secured transactions, corporate finance and M&As, insolvency cross-border insolvency, electronic banking, financing of developing economies. Areas of expertise include establishing both private and listed funds, negotiating investment management documentation. We provide a wide range of services to asset managers and institutional investor clients, such as advice relating to fund establishment, regulatory matters, structuring fund vehicles, investment management and undertakings for collective investment transferable securities. we represent clients in their litigation and dispute resolution needs, from investigations and disputes, to reputational risk management issues. We are available to investment banks, asset managers, hedge funds, private banks and retail banks. Areas we advise on include asset management regulation, bank reform, capital and liquidity requirements, custody and prime brokerage agreements, conduct of business rules and recovery and resolution planning. Our expertise covers advice on contingency planning, insolvency filing requirements, debt restructuring, distressed financing and reschedulings, distressed acquisitions/sales, credit bidding, formal insolvency proceedings. We advise lenders and investors at all levels of the capital structure as well as corporates/directors and banks. The Administrator or in Botswana, commonly referred to as the Executor is the one involved in the duties of the Administrator. Piyush Sharma Attorneys & Co. is involved in numerous Estate matters and Mr. Sharma remains an Executor of various Estates. Disputes in Estates are also common in Botswana and we have extensive experience in representation of a Party that wishes to lay a claim to a portion of an Estate and/or dispute the inheritance that is being wound up. A body of rules that delineate private rights and remedies, and govern disputes between individuals in such areas as contracts, property,and Family Law; distinct from criminal or public law. Civil law systems, which trace their roots to ancient Rome, are governed by doctrinesdeveloped and compiled by legal scholars. Legislators and administrators in civil law countries use these doctrines to fashion a code bywhich all legal controversies are decided. 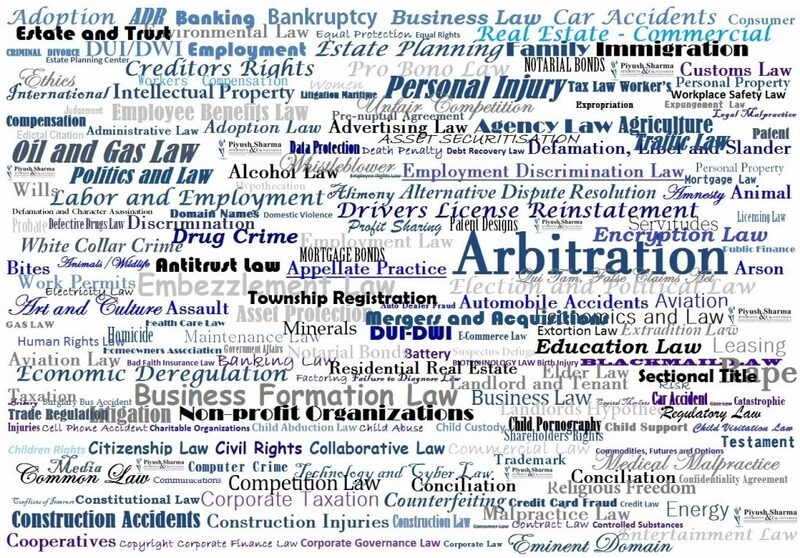 Corporate Law (corporations law, company law) deals with the formation and operations of corporations and is related to commercial and contract law. A corporation is a legal entity created under the laws of the state it's incorporated within. State laws, which vary from state to state, regulate the creation, organization and dissolution of their corporations. A corporation creates a legal or "artificial person" or entity that has standing to sue and be sued, enter into contracts, and perform other duties necessary to maintain a business, separate from its stockholders. We have drafted Employment Contracts for Employers to ensure that they are protected and within the parameters of the Laws of Botswana and International Conventions that Botswana is a signatory to. We also assist Employees in interpretation of the Contracts and guiding them in protecting their rights. We currently represent some Trade Unions in Botswana and represent them in guiding them with Legal Principles and protection of rights. We represent clients in claims in the High Court, Industrial Courts and Court of Appeal. Principles such as no fault divorce, the best interests of the child, parental responsibilities, property division and dispute resolution. Services that help people with particular needs, for example: legal, dispute resolution including counselling, translations. When, where and how to get a divorce. Information on legal issues around separation. What family violence is and how it affects others. How the Courts deal with family violence. How to make arrangements for children during and after separation. How separation affects children. What happens at Court. Forms, publications and information about the family law courts system. How to divide property and assets, including spousal maintenance and . When, where and how to appeal against a court decision. What court orders are and how to follow, change and/or enforce them. Specific information for people from Indigenous, regional, rural or culturally diverse backgrounds or with disabilities. We act on behalf of various international companies and Instructing Law Firms in South Africa, Mauritius, Great Britain, India, Kenya, China and Australia. We register Patents, Trade Marks, Designs, and assist with Litigation on Intellectual Property matters. We have represented clients as resident investigators and have been involved in interdicts, seizure, confuscation and removal applications for Local and International Clients. It covers the rules, policies and laws that oversee the tax process, which involves charges on estates, transactions, property, income, licenses and more by the government. Taxation also includes duties on imports from foreign countries and all compulsory levies imposed by the government upon individuals for benefit of the state. The intricate body of tax law covers payment of taxes to a minimum of four levels of government, either directly or indirectly. Indirect taxes are assessed against products and services that are meant to be consumed, but are paid to an intermediary. We provide services of Involuntary and Voluntary Liquidations of Companies registered in the Republic of Botswana. We have been involved in the process of provisional Liquidation of some Companies and in some cases, where necessary, piercing the corporate veil to expose the Directors and Shareholders of a Company. Where a Defendant (the spouse against whom the Divorce is instituted) lives in another country, a Plaintiff must first approach the High Court or the Central Divorce Court by way of what is known in law as an Edictal Citation Application. This affords permission to a Plaintiff to serve the Divorce documents on a spouse in a foreign country. A Summons in a Divorce must be served on the Defendant in person. The Court needs to be satisfied that service will be done properly by an official of the Court in a foreign country. Edictal Citation is therefore a procedure according to which a legal document such as a Divorce Summons is served by a Sheriff (in some countries known as a "service processor" or a solicitor) in a different country. Nowadays, in our hi tech world, a couple can easily get married in one country, spend most of their married life in another country, and get divorced in a different country altogether. It's nothing new for a couple to get married in Botswana, move to say, New York or London, discover things are not working out, and for one of them to return to Botswana. Strange then that despite all the above, it still is not true – contrary to popular belief - that a Summons can be served via email or by registered post in Divorce proceedings. If your spouse lives overseas, the Court will give an order that it is served on the absent spouse at either their home or their place of work. If your spouse lived overseas but has disappeared; the Court will give directions on a form of substituted service, e.g. by service upon a relative or, perhaps the Attorneys that acted for the absent spouse whilst they were in Botswana and elsewhere. Are domiciled in the Court's jurisdictional area on the date that your Divorce Proceedings commence. that you are usually resident in that area. that you have been living there for not less than a period of one year immediately prior to that date. In the case of a spouse who has disappeared, you, by way of your Edictal Citation Application will have to satisfy the Court that everything possible has been done to trace the absent spouse. This is because personal service is clearly preferable and the least prejudicial form of service. If you want to have a Divorce Summons served overseas you will first have to convince the Court by means of your Edictal Citation Application that there is no other way to have the Divorce Summons served, and in your Application you must supply full details of the Sheriff or the Service Processor to use to serve the Summons in the foreign country. Edictal citation involves communicating and corresponding with people in a foreign country, and the posting of documents overseas. After serving of the Summons in a foreign country, a spouse will have a month to defend the action. If they ignore the Summons or, if they defend it, after reaching settlement of the financial terms the matter may be set down for hearing on a date that has been pre-arranged with the Registrar of the High Court or the Central Divorce Court. Our Litigation team is overseen (under Mr. Sharma) by Attorneys Advocate Efan, Atang Latelang, Grace Muzondiwa, Charles McErick and Juwariyyah Maher. Advocate Khan is a seasoned Lawyer with over 35 years experience as a litigator and negotiator in Botswana, the European Courts, and the United Kingdom. He served at the Attorney General’s Chambers under Ian Kirby (now the Judge President of the Court of Appeal) as his chief litigator before joining this Firm. He has a team of well established and qualified Attorneys in the Firm who include Atang Hilton Latelang, a bright, humble yet very astute Litigator. Atang furthered his LLB degree with further qualifications in Alternative Dispute Resolution, Arbitration and Construction Law. He also has had 4 (four) years experience (prior to joining this Firm as a defence Attorney in Litigation matters. Having this experience, he now represents most Plaintiffs in claims and ensures that the possibility of defence is curtailed from the inception. A highly successful lawyer regarded as a brilliant legal mind by many judges. Grace Muzondiwa with 14 years experience strengthens the Litigation team and is a senior practicing Attorney with a wealth of knowledge in all the Courts in the Country. She is assisted by Charles McErick a bright young talent who hold the award for Triple African Moot Court Champion and is a trail advocate trainer. His Court appearances are acknowledged by Judges to be well prepared and thorough, thereby ensuring that a client’s point is delivered appropriately. The Secretarial Team and is assisted by Cynthia Williams, Rebecca Letsebe, Barbra Modisane, Evelyn Nkuyane and Barati Maswabi who assist in secretarial work. Cynthia has been working as a Debt Collection Secretary for the last 15 (fifteen) years. She has had vast experience in drafting of Legal Documents, Debt Collection, Commercial Drafting and preparation. Cythia is assisted by Rebecca Letshebe, Lebani Golebaone and Evelyn Nkunyane who assist in preparation of documentation, court process, record keeping of files and diarising of matters for Court and filing of documents in Court. They are assisted with the drivers, Phatsimo Mokgwati and Katso Ramaphane. The Law Firm employs the services of Deputy Sheriffs Debrain James Moyo and Deputy Sheriff Onkemetse Medupe. For matters in the North of the Country, we confirm that the Firm employs the services of Stanley Nombolo with whom Mr. Sharma has had a relationship for over 20 (twenty) years. Since the Firm has the notable privilege of representing various Corporate clients and Financial Institutions, we are arrange suitable and subsidised fees to pay the Sheriffs. With the recent implementation of our CALL CENTRE, we are one of the only Firms in Botswana that employs this software and is able to handle Large scale Debt collection with ease and effectively. • We act for various Blue Chip Companies and Financial Institutions. These organisations are all involved in Large Scale Debt Collection and Foreclosures. • As a Member of the NEXTLAW Network, the Firm is now a Global Entity with a representation in all the Major Jurisdictions of the World.